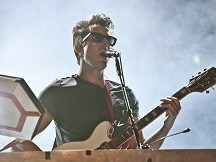 Mark Ronson declared Amy Winehouse a "genius" as he performed a special tribute to the late singer. A day after attending her funeral, the award-winning music producer, who worked with Amy on her second album Back To Black, opened his set at the Greenwich Summer Sessions with a moving rendition of Valerie, accompanied by The Zutons' Dave McCabe who wrote the song. "It's been a s*** week and it's great coming out to play to you guys - that's the great thing about music," he told the crowds. Mark, who was joined by Kyle Falconer from The View, Kurt Hunt from Plastic Little and Phantom Planet's Alex Greenwald, also played a stripped down version of Amy's hit Rehab mid-way through the show, which included tracks like Oh My God, Ooh Wee and Bang Bang Bang. "I went to her service yesterday and a rabbi said, 'A person's life is measured in deeds, not years', hers was pretty f****** special," Mark said of Amy. "I'm not getting emotional or morbid but it's nice to share this moment with people who appreciate good music. Amy Winehouse was a genius and has made more brilliant music than I'll ever make." The 35-year-old invited Charlie Waller of The Rumble Strips on stage for an encore of Back To Black - Amy once told Mark that The Rumble Strips version of the song was "better than ours". The night ended with another emotional rendition of Valerie, with lead vocals provided by Amy's two backing singers, who had supported her for the past 10 years.